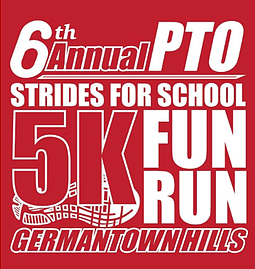 Still a little time to register for the 5k and Fun Run organized by Germantown Hills PTO. The date for registration has been extended through September 10. Course: All races start and finish behind Great Oaks Community Church. Race will be run on grass, not on roads/asphalt. Entry Fee: 5K-$40; 1 mile Fun Run $20 Online credit/debit card payments accepted through PayPal, but will include a small, additional processing fee. Payment details and options are listed below. Packet Pick Up: Runners are to pick up their numbers and race bags on Friday, September 22, 2017 from 4-5:30 at Germantown Elementary School. Packet pick up is also available the morning of the race. Restrooms will be provided at Germantown Hills School. All children participating in the Fun Run will receive a medal. Awards immediately following kids Fun Run. Awards will be given for overall top male and female and top runner up in all age groups.